What can you do for me. I have 6 stairs measuring 22 on one side, 10 on the other and 46 inches wide on curved stairs. ??? You can email in photos with dimensions or drawings into us with the species or stain color you are interested in. We will be happy to take a look and see if we can assist you, and get a quote to you if we can! A closed tread means that there is a wall on each side of the tread, so the ends are "closed" in. The link below will describe all the stair tread styles. Do you have retro fit for open stairs? We have Retro Double Return Treads for open staircases. Below is a link to all of the double return retro treads. You can sort on the left side of the screen by species and stain color. Does this tread have a clear coat or not? This tread has our clear coat applied. Any items on our site noted as "Natural" will be prefinished with our Aluminum Oxide top coat. 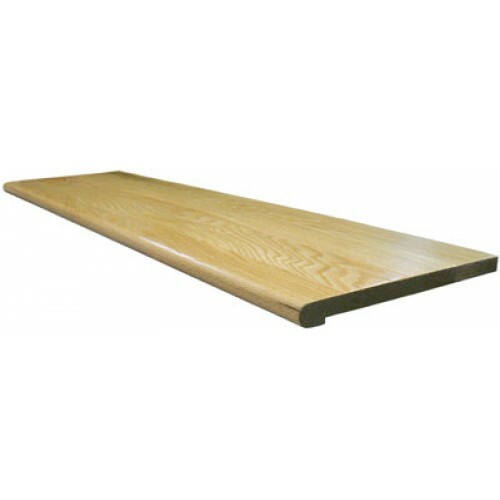 Is your clear finish for oak retreads water or oil based? 130cm*0.30cm Do you have this size? 130 cm x 0.30 cm translates to roughly 51 in x 1/8 in. 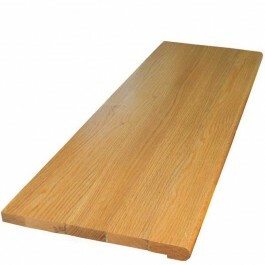 The thinnest tread we will make is 3/4" but do offer risers in 1/4" thickness and wood veneer is available thinner - but we do not recommend wood veneer as a surface to walk on - it's too thin to withstand foot traffic. Our standard width is 11 1/2". Anything smaller than that will need to be cut to fit on site. If you need to make cuts, the step doctor may be very useful for you! Have closed in treads with "cap" on riser the extends 1/4 inch into stairs. Ideally, I need to remove these to install tread but builder glued and nailed. I tried to remove and started to pull top of riser out. Can I cut a kerf on back of these treads to allow a little bending to get these in? You could try and cut a kerf on these treads but it's highly unlikely that they will bend - they're solid 3/4" Oak and very sturdy. Since these particular treads are prefinished, you'd run a good chance of splitting or cracking the finish as well if it did bend. You'd probably have a much better chance of moving the moulding than you would of bending this tread. If you e-mail us a couple of pictures of your installation, we may be able to offer other opinions. I measured my stairs and they are 37 1/2 inches. The pre finished treads are 36" closed. Can I get a larger product from you? The next size up is the 42" tread, which you would have to cut to fit. You can find the 42" Red Oak Natural Retro Tread at the link below.